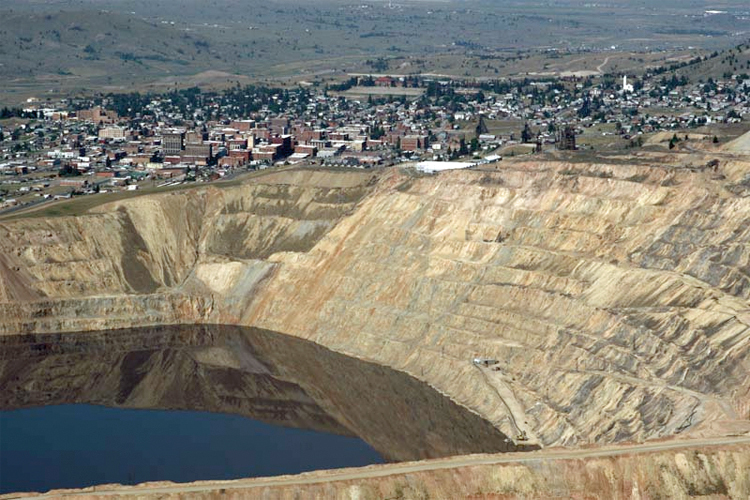 Butte, MT – Berkeley Pit Copper Mine, Marli Bryant Miller. Montanans like to tell stories; over the years, I’ve heard and read a quite a few good ones. One of the best that I have read lately is Ivan Doig’s Work Song, a comic-serious novel set in the historic mining town of Butte, Montana in 1919 just after the fighting ended in WW I. The depot agent, an individual so slow I thought I might have to draw a line on the floor to see him move, was gradually commencing to hunt through the baggage room for my trunk, shipped ahead. Morrie had departed his two previous domiciles hurriedly and the trunk was all he had left in the world, save for his good looks, amiable manner and ability to talk just about anybody into anything. He was in Butte to seek his fortune, but fate had other plans for Morrie. Butte, in 1919, was the biggest and rowdiest of all the copper-mining towns and the powerful Anaconda Corporation owned, controlled, or manipulated everything. The miners, however, were at the verge of mutiny because of oppressive work rules and low pay. When Anaconda decided to lower pay again, some workers began to talk union and a small clandestine worker’s organization was formed. The union man, Jared Evans, grew up in eastern Montana where Morrie had been hiding out from the Chicago mob. Morrie had taken a teaching job in a remote one-room school where Jared was gifted student. Of course they got to know each other well. The story turns farcical when Morrie takes a job as a crier for the local mortuary. But attending miner funerals is a sure way to get to understand the plight of Anaconda’s mineworkers. Against his better judgement Morrie begins to side with the workers and their families. Then the novel takes a serious turn as the tensions in the mine and in the city reach fever pitch. Morrie, now working in the Butte Public Library, comes up with a unique plan to help the union—he arranges for miners to meet in the basement of the library to create a work song that will unite all the worker factions to form a solid, unbreakable opposition to Anaconda. Let’s hear it for the power of song agains the union-breaking thugs of Anaconda Copper. This is a classical story of a confrontation that will only be resolved when one side or the other wins total victory; Anaconda will use force and intimidation, and the miners will resist as best they can. If the miners loose they will be replaced at the mine and the new miners will get less pay. Doig tells this story with emotion and humor. This is a great tale of the early days of the United Mine Workers battles to better the working conditions of miners. Maybe Doig’s timely novel will hammer home the need for collective bargaining better than scholarly arguments by academicians or the uneven rhetoric of politicians. This book is available for download in the Apple eBook store, and, for readers who like to touch and turn paper pages, a paperback edition will be available in bookstores in July 2011. Day 26: Work Song (Ivan Doig) (2010). This entry was posted in eBook, Fiction and tagged Anaconda Copper, Butte, Labor Union, MT, postaday2011, United Mine Workers. Bookmark the permalink.